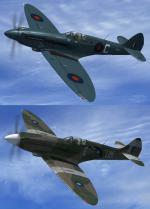 Textures for the payware Realair Spitfire MkIX and XIV. This offering contains 4 custom MkIX and 2 custom MkXIV (XIX) textures. I gladly share them with you. Please also read the ‘My Read Me.txt’ file for more info regarding this offering and for appropriate credit given? CLS 747-200/300 HD textures with Air Force One liverly classic style with Pratt & Withney JT9D-7R4G2 engines. F-16A AM Romania Air Force textures only package for the payware Aerosoft F-16 Fighting Falcon.